Which is the reason why I was able to write and clean up the new Aculeo & Amunet story in two days – and the story, tentatively titled The Altar of the Toad (aka “A&A story #8”), is now in the trusted hands of my long suffering editrix. Now, Toad is a strange beast (…), in the sense it is a short story (hovering at the 5K words mark) with a lovecraftian twist – because that’s what the submission guidelines required – and also a story designed for readers that never met Aculeo and Amunet before. So it sort of re-introduces the two characters, and the few references at their shared background are light-weight and self-contained. 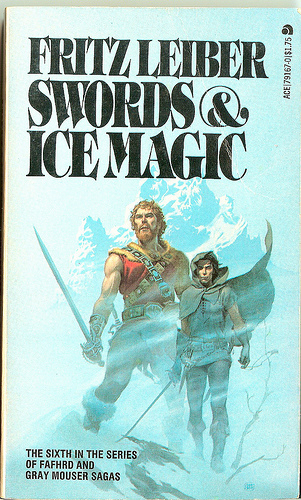 While re-reading my text, I was reminded of Fritz Leiber’s Swords & Ice Magic – no, not because I’m anywhere that good, but because it was my first meeting with Fafhrd and the Gray Mouser, which were by then well established characters with five other books behind them. Five books I had not yet read (and one of them, a much sought-after collector’s item in Italy at the time1). Fafhrd and the Mouser have a strong influence on Aculeo and Amunet – if nothing else, in the fact that these are characters that prefer to chat, bicker and debate than fight, but if fight they must, they are good at it, and yet find no pleasure in it. So I thought back at the way I felt reading Ice Magic, and how I thought this is the sort of stuff I want to write!, and I tried to pull Leiber’s trick – and present the characters as he did, disregarding their past adventures and yet making them a product of their past experieces. I guess the Mistress Editrix first, and later the editor of the anthology to whom I’ll submit the story, will tell me if I did. And now, off to write the next 3000 words of my reworked story. My only worry is that I ditched the first four pages, too – the first four pages I submitted with my pitch and were basically the reason why the story was sold in the first place. I’ll have to crawl in front of the editor for this one.